Having only read information provided on the leaflet, I had no preconceived ideas of what to expect. Funnily enough, one of my favourite elements of visiting the castle was something that was unlikely to have been included on a leaflet/website anyway - the display of Autumnal fruits and flowers throughout the castle. They went a long way in creating a scene and transporting you to a specific time in history; one of seasonal celebration. I think we've pretty much established by now I'm a total nature-fanatic, and so to see such an elaborate display of greenery brought into the dining room was beyond dreamy! 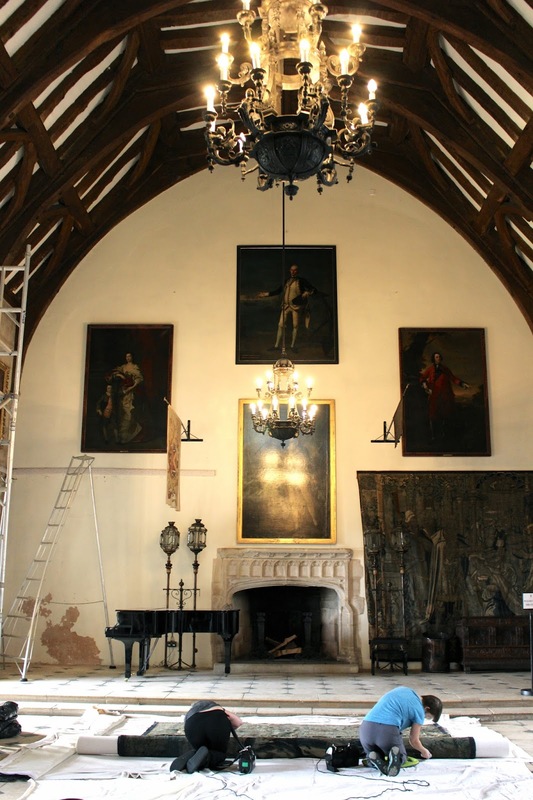 I've long been fascinated by restoration/repairs on historic buildings and their contents - in particular, seeing the action up close (a similar sight this time last year at Warwick Castle). On this occasion, I stumbled across a trio of experts busy at work maintaining a large tapestry in one of the castle's grandest, largest rooms. Fa-scin-ating. 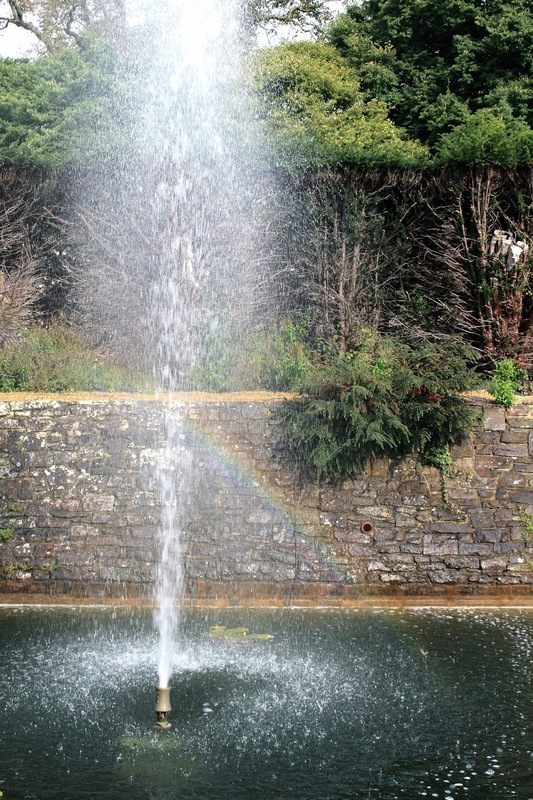 Like most castles and historic houses that have gained popularity in the UK, impressive gardens were just a stone's throw away. Stepping down from a display of small canons and along a bordered grass path, you come across the most beautiful pond filled with lily pads and a central fountain. Thankfully, having visited on a quiet weekday, we had the space all to ourselves for a little while. If you're looking for a tranquil spot for some quiet Autumnal contemplation, consider this it. This brief and beautiful visit to Berkeley Castle proved to be the perfect way to end a stay in the Cotswolds; find more background on this historic site here - or better yet, discover more on a visit there yourself! That castle looks magnificent. I have never heard of it before but it's definitely worth visiting. My objective is to see as many castles as I can! Definitely going to add this one to the list! Oh my goodness!! I need to explore a castle. So beautiful. Wow Berkeley Castle is a stunner both inside and out. the grounds and gardens look as spectacular as the castle. It's really nice how they've opened up these castles to tourism. Oh my god Gabrielle, this place looks like a dream! I think I've said it before, but I envy/live vicariously through your castle explorations, and this is wonderful! I'd never want to leave! I just love living vicariously through you when you visit these gorgeous historical sites. These are my favorite posts of yours! What a gorgeous castle...particularly thanks to the amazing autumn displays! I find preservation and restoration fascinating as well, so I really appreciate your behind the scenes shots! What a magical castle! You're endlessly exploring the world and I love it! The display of the autumn fruits are definitely a cute touch! Such beautiful place Gabrielle ! I really want to thank you for sharing some beautiful places with all of us. Your photography is always out of the world. The picture with fruits is really gorgeously shot. What a beautiful castle, it looks so picturesque and exactly what a castle should be! Wow, this place is heavenly beautiful! The garden is a place where I wouldn't mind spend some time at. I bet it is even more beautiful in autumn. Wow, love all the pictures you make of castle, this one is so majestuous and the dinning room : omg. Definitely need to plan a trip there. This place looks so dreamy, Gabrielle! I am in love with each picture here. You are looking beautiful as always hun, I so want to get my hands on oxblood leather jacket! What a beautiful place Gabrielle! Stunning pictures and outfit darling! What a gorgeous, gorgeous castle! And the photography is amazing Gabrielle! The autumnal display looks amazing and makes the whole place much more alive and warm. It must have been fascinating indeed to see the restoration work going on, I've often dreamed about having this as a job, it must never get boring! I enjoyed this post extremely because of your writing and fantastic photos. The castle is beautiful and even, more so the garden. I could sit in it all day if I could. Such a beautiful castle. Loved the stairs, and your hair always looks so beautiful, Gabrielle. Wow it must feel like you're in a dream or a movie when you walk through this place. It is remarkable to think that people lived in them, so grand! Loving your skirt and whole outfit combo so much. How I wish to visit this castles! Its so exciting and amazing to see such historic and grandeur place. 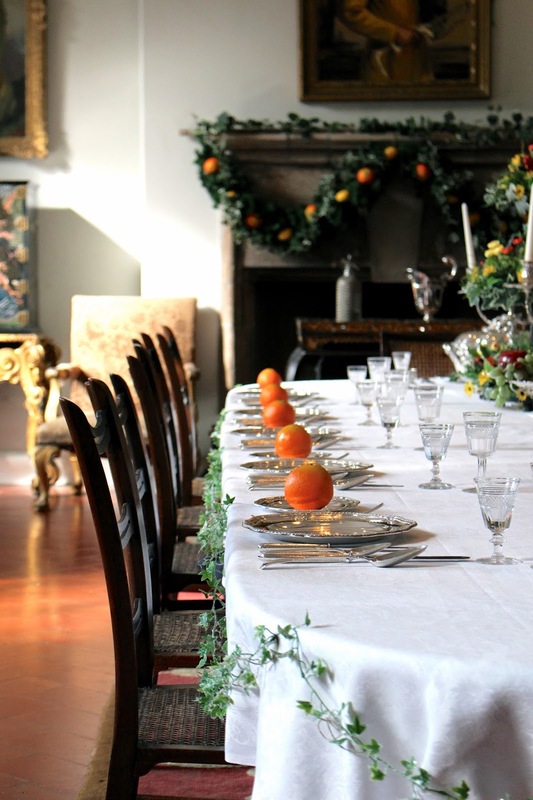 It makes sense that fruit and florals were throughout the castle, as fruit especially was always incorporated in environments and to eat of course. It looks like such a feast being prepared to delight in. This must have been lovely to see and I'm also a fan of the Cotswolds. Thanks for sharing, Gabrielle. Can I have the decorated table at my house, pleaseeeee!!!! I love it so much!!! What a lovely place you visited, you took some amazing photos! It looks really serene there and I agree that the seasonal touches of nature really make it standout! We have quite a few castles in Luxembourg but none of this kind. Everything looks like it is maintained with lots of love! Amazing pictures! And you're super gorgeous! I have to admit that although I know Gloucestershire quite well, I hadn't heard of Berkeley Castle. Those floral displays really are superb, thanks for sharing! How cool is it that you actually saw people in the midst of restoration work? I would have stayed for a couple of hours to see what they do. I bet it's a delicate process. That is #DiningTableGoals! What a beautiful castle and I love the giant paintings, very Harry Potter-esque which is my type of world! I've never heard of this castle before, it reminds me a little of Alnwick Castle inside, gorgeous decor isnt it! I really like the Autumnal touches they have going on. Wow, this place looks absolutely incredible. The outdoors remind me so much of The Princess Diaries. it really looks like it just came out straight out of a fairy tale. Berkeley castle looks absolutely stunning especially with all the lovely autumn decorations - so dreamy! What a lovely ending to your stay in the Cotswolds! Beautiful pictures, beautiful place. I love the plants around the table and the paintings everywhere. I would really love to visit. Wow, this is such a beautiful and charming castle! 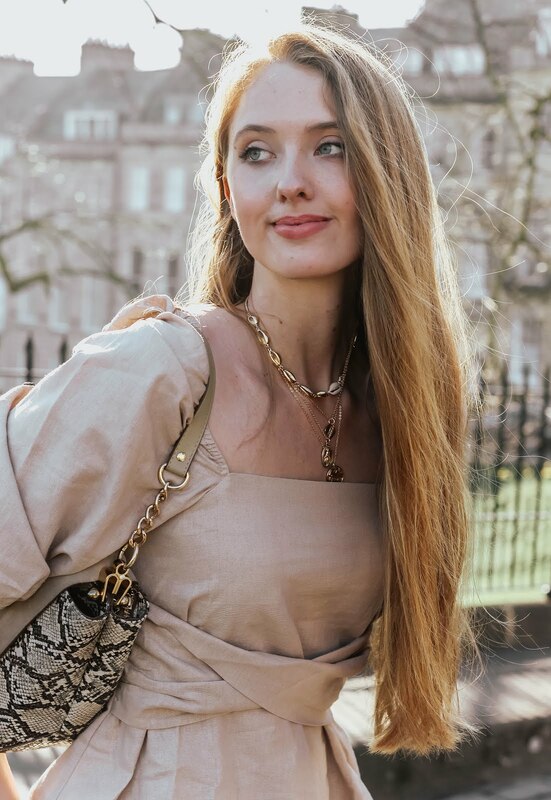 I've never been to Europe before, but having read many of your posts with such gorgeous photos, as well as seeing them all around Instagram, I have such a great desire to visit each day! Thanks so much for sharing, gorgeous, and I hope you're having the most amazing week so far! There is so much history there Gabrielle! It transforms you to another period of time. It's absolutely exquisite. That's what I admire about Europe! The historical estates are amazing. I love both the inside and outside. The gardens are charming. Oh Gaby this is so full of charm! I have to admit that I heard about Berkeley Castle but I have never visited it - much to my regret!!! Thanks for sharing these breathtaking photos! Your photography is commendable.. Stunning pictures and the castle is beautiful. non ho parole...è un luogo incantevole! I agree, the display of fruits and autumnal pieces is the cherry on the cake. Omg! this place is soooo beautiful! You look amazing pretty, loving your hair as well. That castle looks absolutely stunning! I find restoration work very fascinating, too! The castle looks absolutely amazing!!! It looks lovely here, the gardens look so pretty! Gabrielle, this place is perfection!! 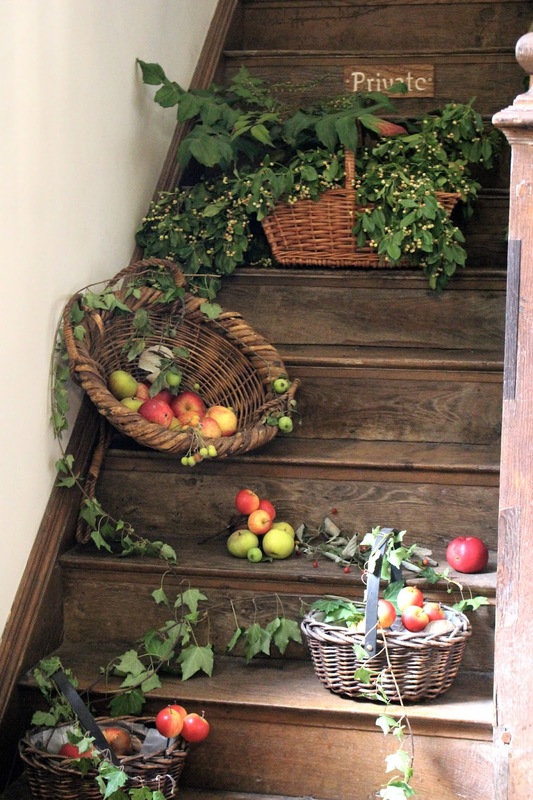 So in love with the baskets of apples on the stairs... dreamy! It looks amazing! I always love exploring places like this. I love the little autumn display too! wow this is a beautiful castle. I can't believe it has been the home of the same family for so long! So many generations lived there! The seasonal decoration is gorgeous and it's impressive how well they take care of this place. You always transport us away with your post! Absolutely stunning location and that table spread is screaming fall fabulousness!!! How lovely is this place !